Shri Govind Dev Ji temple needs no introduction as it is one of the most famous and pious spiritual places to visit. The temple is a witness to the thousands of devotees coming from all over the world to see its magnificence and symbolism of Hindu mythology. The city palace, where Maharaja Sawai Jai Singh II held the highest respect, now houses this temple. The temple is dedicated to Lord Krishna and beautifully symbolises the royal era of Jaipur. Surrounded by beautiful gardens, the interior of the temple boasts of magnificent European style chandeliers and many paintings depicting the Indian art and culture. The ceiling of the temple is done up in dazzling gold. The idol of Govind Dev Ji in this temple is considered to be one of the most beautiful and fascinating images of Lord Krishna. The temple opens for devotees at around 5.00 am with an ‘aarti’ and melodic ‘bhajans’.Every day the idol is worshipped with ‘prasad’ and devotional ‘bhajans’, at seven different times during the day, are sung fervently. Though the temple is always swarming with the devotees, with the numbers sometimes crossing the mark of 5000 even on regular days, it takes on a different hue during Janmashtami, the birth day of Lord Krishna. The festival is celebrated with much enthusiasm and fervor with the temple shining in all its glory. The Govind Dev Ji temple is one of the most divine and cherished temples in India. The city of Jaipur takes pride in being home to this famous temple. 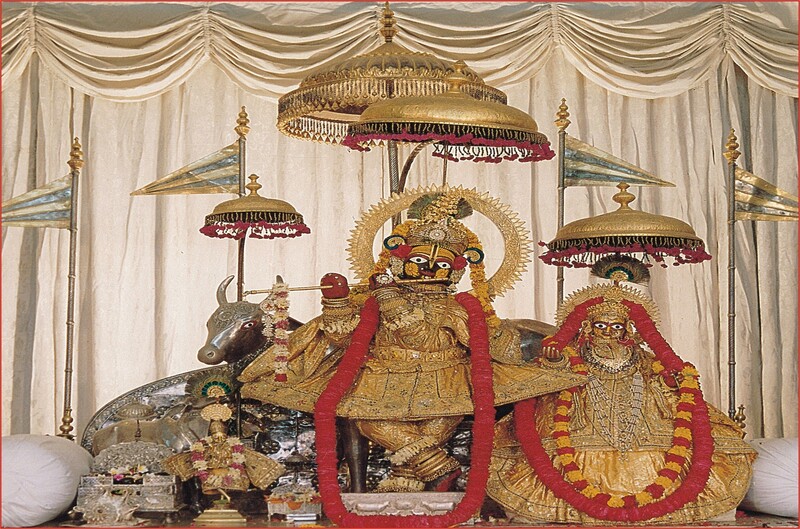 It is considered to be the most sought-after temple, after the Vrindavan temple, for the followers of Shri Krishna. Legend says that once Maharaja Sawai Jai Singh II had a dream, where he was told by the Lord Krishna to place his idol in his palace to save the place from destruction by the Mughal Emperor Aurangzeb. Maharaja Sawai Jai Singh then brought the idol from Vrindavan to his palace Surya Mahal and then shifted it to Chandra Mahal. It is believed that the idol is an identical copy of Lord Krishna during his incarnation on earth. Legend suggests that the idol was created some 5000 years ago by the Lord Krishna’s great grandson, Vajranabha. When Vajranabha was 13 years old, he asked his grandmother to describe the cherished Lord Krishna. From whatever description she gave him, he tried to sculpt an image of Lord Krishna, but failed two times in creating an image. In the third attempt, he managed to create an image exactly replicating the Lord. 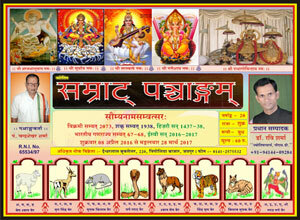 The idol was then named Bajrakrit which means ‘Creation of Bajra’. Shri Govind Dev Ji temple is situated in the City Palace Complex between the Badal Mahal and Chandra Mahal. You can reach the temple by an auto rickshaw, taxi or by local buses. The desert city of Rajasthan, Jaipur, attracts thousands of tourists from all over the country and abroad. Due to its closeness to the desert area, the city experiences an extreme climate, where the summer season is extremely hot. The months from March till June, when the maximum temperature can reach up to 45 degrees, may not be the best time to visit the place. Though the monsoon season should bring relief from the scorching sun, it does not provide any relief as such. The season starts from July and lasts till September. Jaipur does not receive abundant rainfall, though the scanty rainfall which the city receives leaves behind a lot of humidity, making it impossible to take a tour of the city. The best season to visit this wonderful city is during the winter months, from October to March. The maximum temperature is around 20-22 degrees, when the intensity of the scorching sun is at its lowest. The nights are cooler, with the temperature dropping to about 5 degrees, while the days are extremely pleasant, and you can enjoy every bit of the city’s heritage beauty and take back a memorable experience. Being a prime destination spot, the city is well-connected to other parts of the country and the world through various transportation modes. The city is well-equipped with a domestic airport, which is at a distance of 7 km from the main city, while the international airport is at a distance of 10 km. From the airport, you can hire a taxi or a bus and reach your desired destination in and around Jaipur. The railway station is located at a convenient distance of 5 km and is well-connected to the main city. The railway network is quite vast and there are many trains which connect Jaipur with different cities across India. The city has three main railway junctions, the main station at Jaipur, the other at Gandhinagar and the third one at Durgapur. From the railway station you can take a bus, an auto rickshaw or hire a taxi and reach the main city. For a comfortable and luxurious experience, a journey on ‘Palace on Wheels’, is a must. The train provides an experience of a lifetime. The Pink City is also connected with the major cities through a strong network of national highways. The Rajasthan State Transport Corporation has a fleet of deluxe, semi-deluxe, Volvo and non AC buses, which make travelling more comfortable for tourists. There is also an excellent bus service between Delhi and Jaipur, with buses plying at a frequency of every half an hour. From Delhi, you can take a bus from Bikaner house located near the India gate and reach the Pink City. A journey to this beautiful city is as charming as it is stunning.